Quick results from the MX of Nations. 1st Paulin (France), 2nd Dungey (USA), 3rd Nagl (Germany), 4th Van Horebeek (Belgium), 5th Tonkov (Russia)…. 14th Chad Reed (Aus), 22nd Luke Clout (Aus). 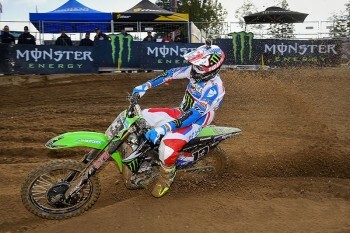 1st Strijbos (Belgium), 2nd Frossard (France), 3rd Wilson (UK), 4th Searle (UK), 5th Noren (Sweden)…. 15th Matt Moss (Aus), 21st Luke Clout (Aus). Scott Columbs 7th (click here for his crash) and Hamish Dobbyn’s 12th with Hamish Harwood’s 22nd not counted gave NZ 4th place in the B final behind Ireland, Spain and Japan and 23rd place overall. Late crashes deny Team Australia top 10 finish overall. France has been crowned winners of the 2014 FIM Motocross of Nations in a hotly-contested 68th edition at Kegums in Latvia on Sunday. The French team of Gautier Paulin (MXGP), Dylan Ferrandis (MX2) Steven Frossard (Open) was all class on its way to victory, picking up the country’s second-ever overall, in what was a disappointing end result of 14th for Team Australia’s Chad Reed (MXGP), Luke Clout (MX2) and Matt Moss (Open). Race one (MXGP+MX2) was a difficult one for the Aussie duo of Reed and Clout, with Reed battling mid-pack throughout to finally finish 14th and Clout clawing his way from outside the top 30 to a credible 22nd on debut – ninth of the 250s. Up front it was Husqvarna’s Aleksandr Tonkov (RUS) who led early on board a FC 350, before Gautier Paulin (FRA) ultimately took charge to win from Ryan Dungey (USA) and Max Nagl (GER). The big news was eight-time world champion Antonio Cairoli (ITA) crashing out of the top five on his 250 SX-F while leading the MX2 ranks, and then late in the moto Dylan Ferrandis (FRA) made a pivotal pass on American champion Jeremy Martin (USA) to finish ninth. Following moto one it was France the leaders from USA and Belgium, with Australia sitting seventh despite the difficulties of Reed and Clout’s slow start. The second moto (MX2+Open) was an improvement for the Aussies, as Moss rallied to 15th (10th of the Opens) and Clout 21st (eighth of the MX2 riders). Moss battled with Martin in the early stages and made the move on him at one point, until a minor error saw the American return the favour. After running as high as 13th, from there Moss slowly dropped to 15th. Clout meanwhile had a far better start this time out, running inside the top 20 for much of the moto until Cairoli stormed past late in the moto to bump him back to 21st. It was all Kevin Strijbos (BEL) at the head of the pack though, winning from early leader Steven Frossard (FRA) and Dean Wilson (GBR), who combined with Tommy Searle (GBR) in fourth, had a stellar ride for the Brits. Swedish star Fredrik Noren (SWE) held out a late advancement from Eli Tomac (USA), the American coming in well below expectations in sixth. Those results placed France at the top ahead of Great Britain and Belgium, with USA outside of the podium in fourth and Australia remaining seventh. But it would all turn pear-shaped for the Australians on the opening lap of moto three (Open+MXGP), as Reed crashed out of the gates and exited the race, before Moss went down hard himself later in the lap and immediately returned to the pits once remounting. Moss would be scored 36th and Reed 38th after their non-finishes, with the latter being scratched and leaving the Aussies on 108 points overall. Those results dropped Australia down the order in the Nations ranking, eventually resulting in 14th in a disappointing end for the team that showed so much promise during the weekend. Paulin was able to make it two wins at the front however, racing to victory over Jeremy Van Horebeek (BEL) and Eli Tomac (USA), who worked his way through the field from a first turn crash in a spirited ride. Teammate Dungey was also forced to come from the back, winding up 11th. Winner of the MXGP class for the weekend was the perfect Paulin, while Searle won the MX2 overall and Frossard topped the Open classification in a sweep for the factory Kawasaki squad. Overall it was France who won the Nations comfortably ahead of Belgium and USA, which scraped through for a podium after Great Britain’s Shaun Simpson had a chain break in the final moto. Australia was 14th. New Zealand’s team of Hamish Dobbyn (MXGP), Hamish Harwood (MX2) and Scott Columb (Open) missed out a main event berth, finishing fourth in the B-Final that commenced Sunday’s proceedings.